The GtkNoteboopk implementation of the GtkBuildable interface supports placing children into tabs by specifying "tab" as the "type" attribute of a <child> element. Note that the content of the tab must be created before the tab can be filled. A tab child can be specified without specifying a <child> type attribute. the GtkWidget to use as the contents of the page. the GtkWidget to be used as the label for the page, or NULL to use the default label, 'page N'. the index of the page containing child , or -1 if child is not in the notebook. the edge to draw the tabs at. TRUE if the tabs should be shown. TRUE if a bevel should be drawn around the notebook. gtk_notebook_set_scrollable is deprecated and should not be used in newly-written code. gtk_notebook_set_tab_border is deprecated and should not be used in newly-written code. Sets the width the border around the tab labels in a notebook. This is equivalent to calling gtk_notebook_set_tab_hborder (notebook , border_width ) followed by gtk_notebook_set_tab_vborder (notebook , border_width ). the index of a page in the notebook, or -1 to get the last page. the number of pages in the notebook. gtk_notebook_query_tab_label_packing has been deprecated since version 2.20 and should not be used in newly-written code. Modify the “tab-expand” and “tab-fill” child properties instead. Query the packing attributes for the tab label of the page containing child . gtk_notebook_set_homogeneous_tabs is deprecated and should not be used in newly-written code. TRUE if all tabs should be the same size. gtk_notebook_set_tab_hborder is deprecated and should not be used in newly-written code. Changes the tab label for child . If NULL is specified for tab_label , then the page will have the label 'page N'. gtk_notebook_set_tab_label_packing has been deprecated since version 2.20 and should not be used in newly-written code. Modify the “tab-expand” and “tab-fill” child properties instead. Modifying the packing of the tab label is a deprecated feature and shouldn't be done anymore. Sets the packing parameters for the tab label of the page containing child . See gtk_box_pack_start() for the exact meaning of the parameters. gtk_notebook_set_tab_vborder is deprecated and should not be used in newly-written code. whether the tab is reorderable or not. If you want a widget to interact with a notebook through DnD (i.e. : accept dragged tabs from it) it must be set as a drop destination and accept the target "GTK_NOTEBOOK_TAB". 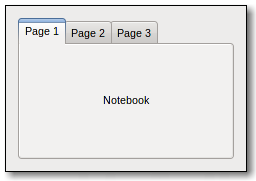 The notebook will fill the selection with a GtkWidget** pointing to the child widget that corresponds to the dropped tab. gtk_notebook_set_group_id has been deprecated since version 2.12 and should not be used in newly-written code. Sets an group identificator for notebook , notebooks sharing the same group identificator will be able to exchange tabs via drag and drop. A notebook with group identificator -1 will not be able to exchange tabs with any other notebook. gtk_notebook_get_group_id has been deprecated since version 2.12 and should not be used in newly-written code. Gets the current group identificator for notebook . the group identificator, or -1 if none is set. gtk_notebook_set_group has been deprecated since version 2.24 and should not be used in newly-written code. Sets a group identificator pointer for notebook , notebooks sharing the same group identificator pointer will be able to exchange tabs via drag and drop. A notebook with a NULL group identificator will not be able to exchange tabs with any other notebook. a pointer to identify the notebook group, or NULL to unset it. gtk_notebook_get_group has been deprecated since version 2.24 and should not be used in newly-written code. Gets the current group identificator pointer for notebook . the group identificator, or NULL if none is set. gtk_notebook_set_group_name is deprecated and should not be used in newly-written code. Note that this funtion can emphasis not be used together with gtk_notebook_set_group() or gtk_notebook_set_group_id(). Note that action widgets are "internal" children of the notebook and thus not included in the list returned from gtk_container_foreach(). A function used by GtkNotebook when a detachable tab is dropped in the root window, it's used to create a window containing a notebook where the tab will be attached. This function will also be responsible of moving/resizing the window and adding the necessary properties to the notebook (i.e. : group-id). If the function returns NULL, the drag will be cancelled. gtk_notebook_set_window_creation_hook has been deprecated since version 2.24 and should not be used in newly-written code. Installs a global function used to create a window when a detached tab is dropped in an empty area. GtkNotebookPage is deprecated and should not be used in newly-written code. The GtkNotebookPage is an opaque implementation detail of GtkNotebook. gtk_notebook_current_page is deprecated and should not be used in newly-written code. gtk_notebook_set_page is deprecated and should not be used in newly-written code. Group for tabs drag and drop. GtkNotebook:group has been deprecated since version 2.24 and should not be used in newly-written code. Group ID for tabs drag and drop. Group name for tabs drag and drop. Deprecated: 2.20: The tab packing functionality of children should not be used anymore and support will be removed in the future. A handler for this signal can create a window containing a notebook where the tab will be attached. It is also responsible for moving/resizing the window and adding the necessary properties to the notebook (e.g. the “group” ). The default handler uses the global window creation hook, if one has been set with gtk_notebook_set_window_creation_hook().